Everyone at some point feels stressed. There’s too many ideas, too many problems, or simply too many options. It can leave a person feeling strained and exhausted just thinking about it all. What can you do when you find yourself drowning in brain clutter? Besides making a habit of writing Morning Pages, there are some simple ways to help iron out your thought process and make a decision. One of these delightful methods is creating a mind map. A mind map is really a very simple idea. Basically, you pick a subject matter that you’d like to explore, such as ways to build experience in a hobby. Then you piece together individual ideas visually on paper, much like slowly putting together a puzzle. You can then build a chain of thoughts, laying each one out one by one. This allows you to pull the information out of your head and put it in a neat, hierarchical order. It lays the information out so simply and easily that anyone should be able to follow your reasoning later. This technique is excellent when you are struck with inspiration for a project and you have lots of ideas. It’s also great when you are stuck in a rut and need some creative thinking to find a solution. 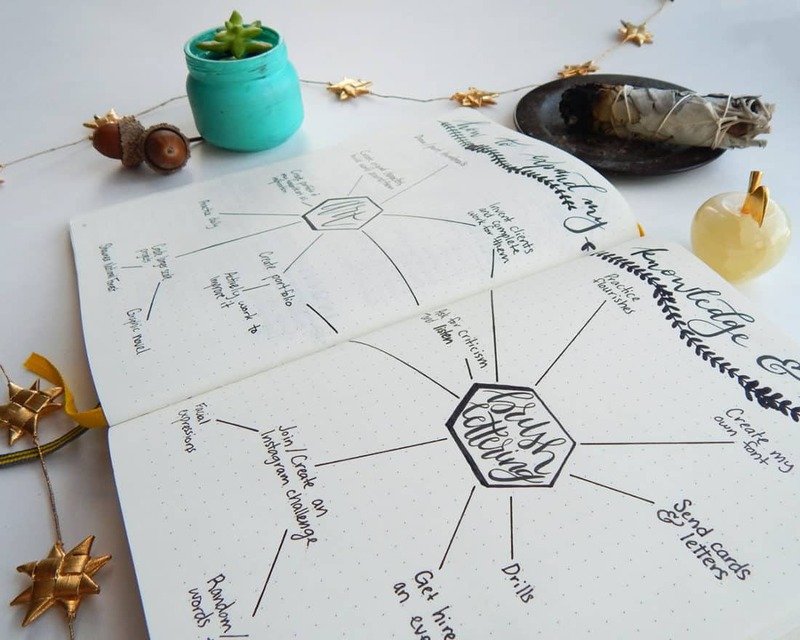 When you draw out a mind map, it can help you find a connection between ideas that might otherwise have slipped through. Sometimes seeing the information instead of thinking about it can have an enormous effect on how you process it. 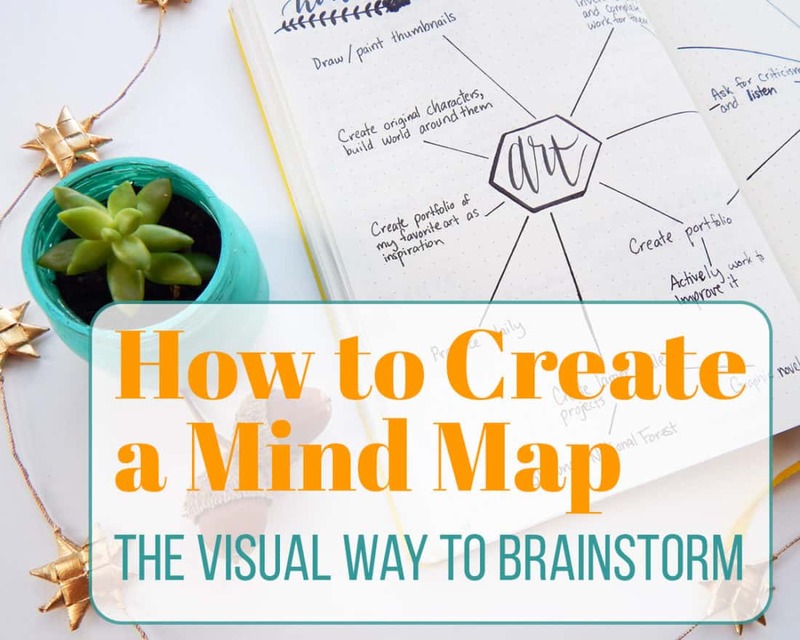 A mind map is super easy to create. 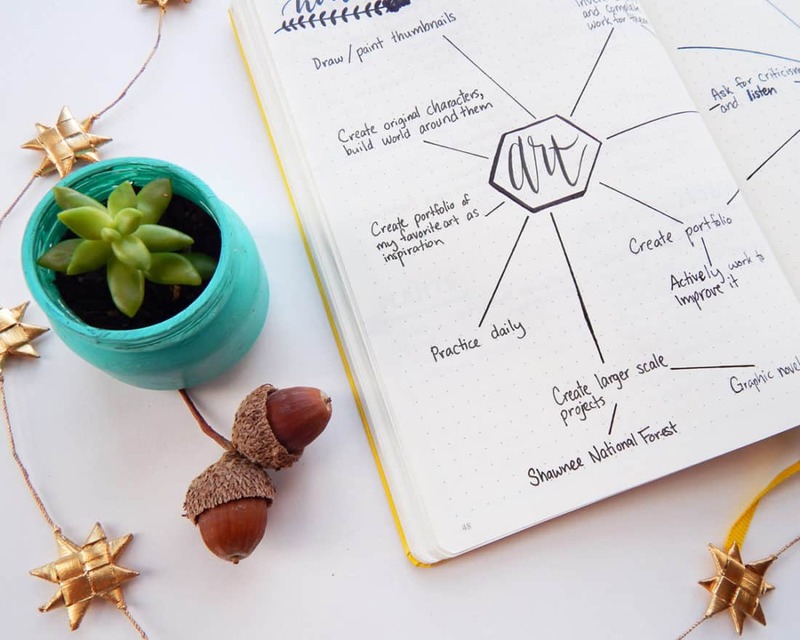 All you need is a somewhere to write down your thoughts – it could be your journal, a dry erase board, or even a big network of Post It notes stuck on a wall! Just make sure you have room to spread out and explore your ideas. For my mind map, I had two connecting main ideas – brush lettering and art. I used two here because several of the ideas I brainstormed overlapped into both categories, much like a Venn diagram. While a Venn diagram is great for identifying similarities or differences between two or more ideas, a mind map encourages you to elaborate on details. Also, I decided to play on the brush lettering thought and create a cute little header with my Tombow Fudenosuke. After I had my two main focuses written down, I began to brainstorm ideas on how to build experience in those areas. I have ideas such as creating Instagram challenges, building portfolios for my work, and so on. For some of those ideas, I elaborated by creating more connecting thoughts. For instance, in my art mind map, I wrote that I need to create large scale projects to help build skill. I brainstormed a few examples for the kind of large scale project that would fit that criteria. Then I simply drew a line to the original idea to show the connection. If you want clean, straight lines, I’d suggest you grab a little metal ruler. That’s what I used here and it was so handy to have around! Basically, all you need to do is get more and more detailed with your ideas until you have reached the end of a thought process. If two ideas are connected with each other, then connect them on your mind map! You can make it as simple or as wild as you want, so long as it helps you process all your brain clutter effectively. This technique is just one of those example of less is more. There is no fancy trick or secret step to making this work for you – it’s just a pure, simple way to process information. It’s especially lovely to break out a mind map in my bullet journal if I’m trying to puzzle out a project or I just want to brainstorm. It has a stabilizing effect, no matter how frenzied or slow my brain is that day. It can pump up the creative thinking or drain some of the pressure from thinking too much. Plus, they’re just so much fun to do! It’s so exciting to connect ideas and discover little “Aha” moments while doodling and being a bit silly. Because a mind map can be whimsical or serious or anything in between. It really is perfect for everybody. 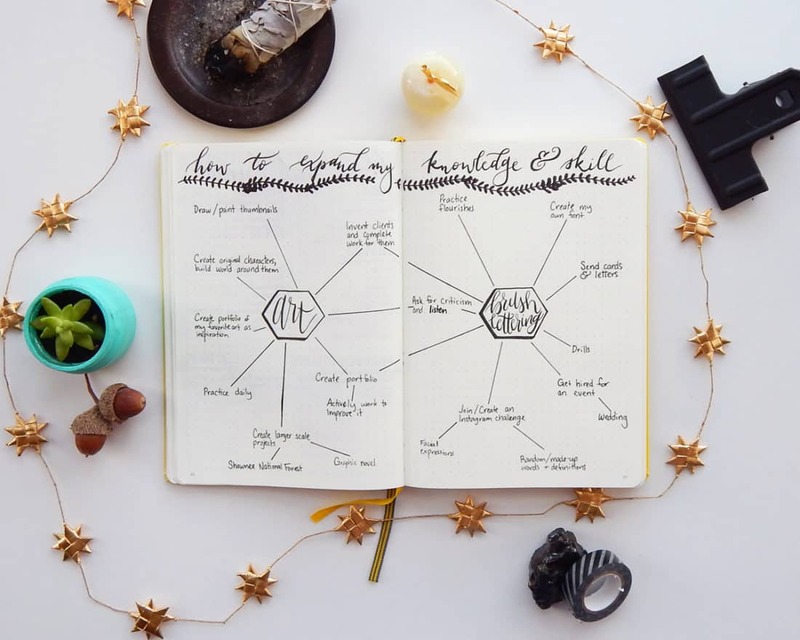 So the next time you are trying to handle a stressful situation, think outside of the box, or come up with new and unique ideas, give the mind map a try. You will find yourself solving any problem in no time with greater clarity and a better perspective! Today I found this and it’s wonderful..
From now I am your regular visiter..
Glad to have you here Rishav! Hi Shelby ….this is a new technique for me n i feel that ..if i will include this in our daily routein then i change my life …plz tell me if i make our daily routein mind map then how it will be done . If you wanted to incorporate this into your day, I would suggest you just start with the date at the center of the mindmap. Then, as you think of stuff you want to accomplish that day or in the near future, draw out a new arm on the map and start writing those down! It would be a fantastic way to brainstorm each morning for all your goals! Thank you for this post – very helpful. I was trying to figure out a way to re-energize a job search effort and with some many little things I needed to do I was just overwhelmed and getting nothing done. I needed a reminder about mind maps. I’m glad to hear this was helpful and timely for you Jessica! Best to you and your job search. I Gave a click to download the planner printables and brush lettering worksheets you offers for free. You sent me an email and the link in there is not working more. Sorry to hear that Indira! Can you let me know if you are able log in to the Resource Library anf what you are not able to access so I can look into this for you? Just wanted to say thank you ………. I was looking and found Little Coffee Fox. Wonderful insperation. Enjoy your pages so much. Wishing you well with your future projects. Sue, I’m so glad to hear that you enjoy the blog! Thank you so much for your kind words 🙂 it really means a lot!